The outdoor track and field season is here and that means preparing to run the 4x100 meter relay. 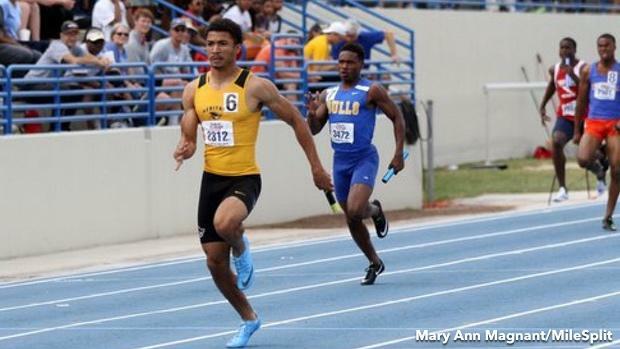 This weekend, in particular, is a huge one for the relays, as national-level meets like the Texas Relays and Florida Relays are on the calendar. A winning effort comes not only by having fast athletes but also by being proficient at getting the stick around. There is no standard way to hand off the baton. Teams historically have used different methods which have garnered success. There are push passes, underhand passes, or overhand. Some teams use different arm and hand positions. Most teams use verbal commands, some don't. What matters most, however, is that all team members accept the strategy implemented by the coach, cooperate together, and execute their game plan with precision. The 1st and 3rd legs of the relay should carry the stick in the right hand and run on the inside half of the lane--it's the shortest distance around the curve. The straightaway runners on the 2nd and 4th legs should run on the outside half of the lane, and hold the stick in their left hand. This allows the baton to travel down the middle of the lane during an exchange. It also prevents the incoming runner from clipping the heels of their teammate on the way into a hand-off. There should be a mark placed on the ground in the lane before the acceleration zone. Once the incoming runner reaches the mark the outgoing runner takes off. This distance varies among pairs of athletes and must be tested in training. The quality of an exchange is not about how fast the stick goes from one runner's hand into the other runner's. Instead, quality is about how fast the baton is being carried through the zone before, during, and after a pass-the baton must move through the zone. 1. Watch your incoming teammate as they run toward you; do not leave until they definitely reach the mark. 2. Once you start you must never again look back. Look to where you are headed. Accelerate away with the same energy as you would in the 100m dash. 3. Stay on your half of the lane as you accelerate. 4. When you put your hand back, give your teammate a stationary target to aim for. Do not move your hand around behind you or open and close your fingers in anxiousness. 5. Even though you can't see your teammate during a handoff, trust them. Wait for the stick with your receiving arm back and the other arm still stroking in a running motion. This may take more than one step. 6. Once you feel the baton in your hand, take it and go. 1. Run a full relay leg. You must keep sprinting with the stick through the exchange zone as though you are racing your outgoing teammate--like you want to overtake them, even though you won't. 2. Stay on your side of the lane. 3. When using a verbal call, yell it clearly once you've closed the gap enough between you and your teammate, but not too close to where you are right on top of them. Bad relay runners stick the baton out at the same time they yell a command. They run while holding the baton out in front of them, waiting for outgoing runner's hand. Since this mistake disrupts sprint form, it's a sure way to slow down and have the outgoing runner get away from you. Keep in mind that after you yell ("STICK!" "HIT!" or "HAND!") there is a slight delay. It will take your teammate a step or two to react to your voice and get their hand into position. Do not try to aim for your outgoing teammate's hand as it's moving into position. Just yell your command, continue stroking your arms while you wait for your teammate's hand to get in position...THEN hand them the baton. In doing it that way you're guaranteed to keep up with the outgoing runner. It's not important that you hand the baton off the instant after you yell the command as long as you're still moving down the track with it. You are never in trouble if you're actively sprinting with the baton since it's still moving through the zone.